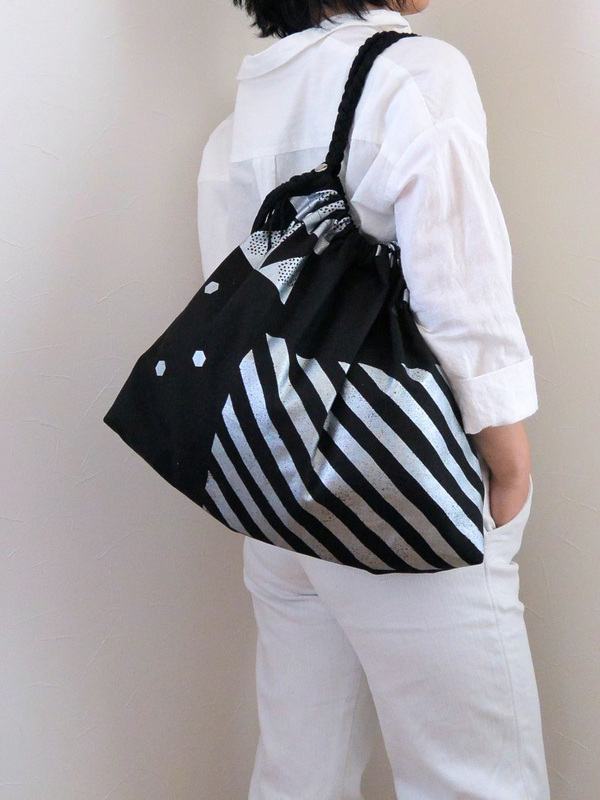 This chic black and silver tote bag is made with echino’s new design. 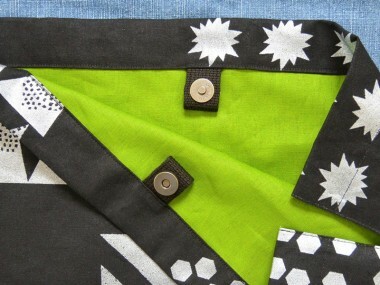 The bright green solid lining fabric is also from echino. 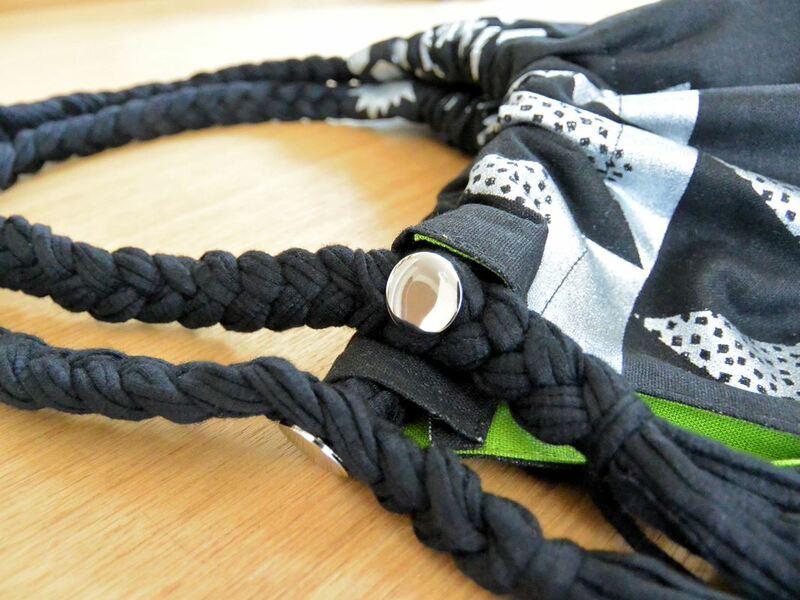 The braided T-shirt yarn handles make this bag even more stylish. 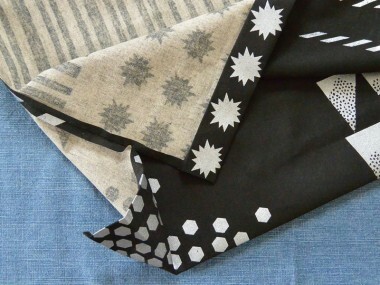 The pattern is large and bold, yet has a chic feel in silver print against the black background. 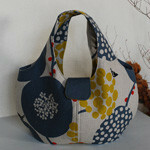 I tried to create a bag that is not too cutesy with a shape that is suitable for a grown woman. 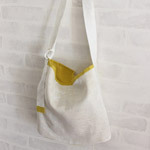 The bag itself is easy to make, as it is a larger version of a drawstring bag, like a lunch bag. 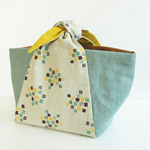 So I added a little design twist to the handles, made with T-shirt yarns. This material is extremely popular right now, and easy to find. It only requires braiding, which you can do in an hour. There are no tricky processes in particular. Make sure that back stitches are secure on both sides. 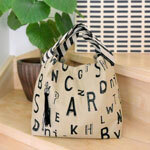 The style of this bag makes it easy to coordinate with any type of clothing. 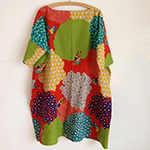 Unlike acrylic tapes, T-shirt yarn comes in many colors and patterns. 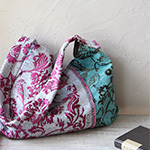 You can add your own accent by mixing colors or using bold patterns for the shoulder straps. 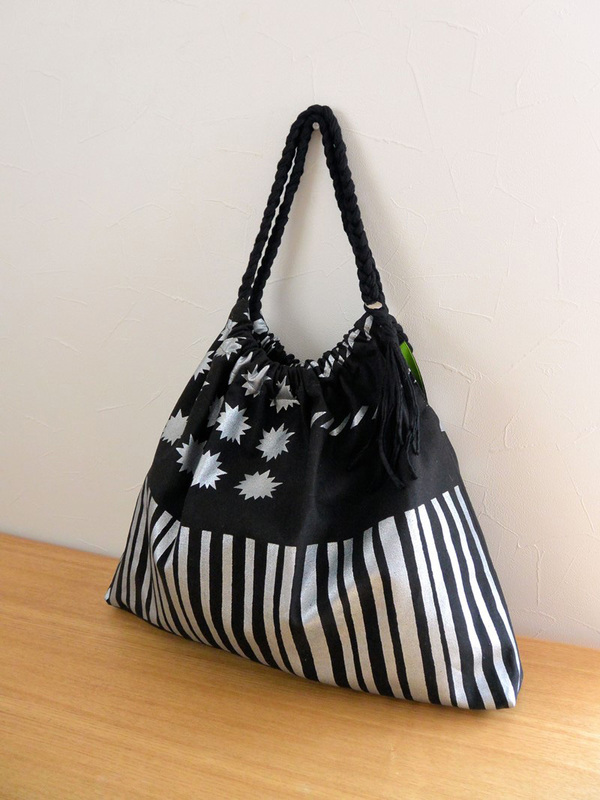 For this bag, all you need to do is to make an outer bag and a lining bag. 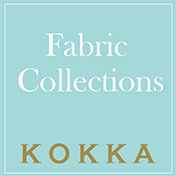 To make your process easier, pay attention to details – pressing the seam open, fold the seam of the opening in three and iron the fabric before sewing. I used the tab with magnetic hooks for the closures of the opening. 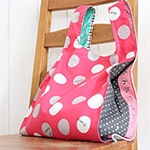 The tab creates extra room, so you can take things in and out without fully opening the top. It is convenient. Top opening is created with one quick process by layering the tab and lining fabric and make the opening for the strap at the same time. Note that it gets pretty thick where the tab is. 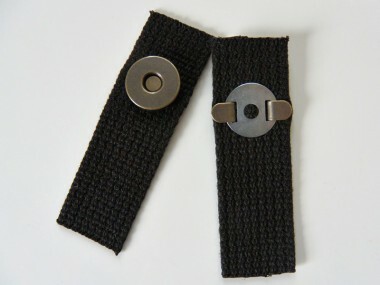 Use a thicker needle and operate the sewing machine slowly. 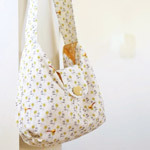 Make the shoulder strap. 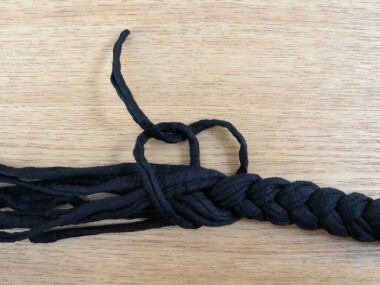 For each braid, you need three groups of four yarns. Place six lines of yarns and fold at the center to start. Put a button through one of the yarns. 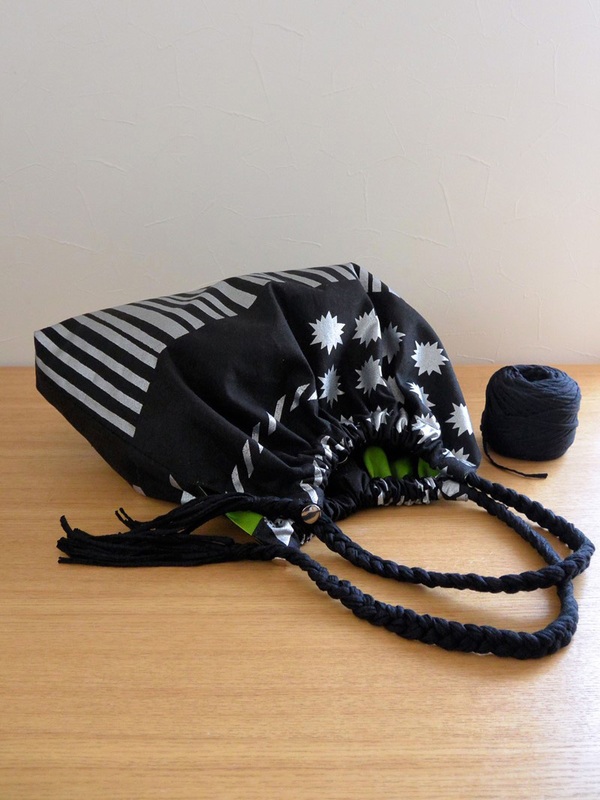 Keep braiding and finish it by wrapping around one of the long yarns around the other yarns and tighten. 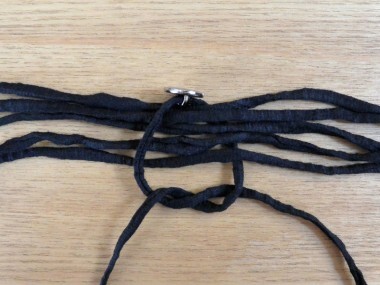 Put the braided yarn through the opening for strap. At your favored length, secure the strap by putting the button through the braid to finish.